One of my guilty pleasures is reading or watching people's morning and nighttime routine posts. I have no idea why I find them so intriguing but there's something about getting a peek into someone else's life and seeing what they routinely do everyday! Since summer is over halfway over, I guess you could say I've gotten a routine down for weekend mornings (because let's be honest, weekend mornings are much more interesting to read about than weekdays when I wake up and get ready in 10 minutes). Here is a look at what a weekend morning looks like for me! It depends on my schedule and what I have going on that day, but usually I'll wake up anywhere from 8:45 to 9:30. In bed I'll check social media, take a look at my new emails, read my favorite blogs and make a mental to do list for the day. Again, it really varies on whether or not I'm working that day, but most often I take my time in the mornings and brush my teeth, hair, etc. I typically shower and wash my hair at night and then rinse off again in the mornings so I feel fresh for the day. After that, I'll tidy up my room, make my bed and plan out my outfit. It doesn't always happen, but I really try to sneak my everyday workout routine in here too! Around 10:00 am I'll make myself some breakfast and either whip up a quick smoothie or put together a yogurt parfait (greek yogurt from Trader Joe's has been my favorite lately!). While I eat I'll either catch up on things on my phone, chat with my family, watch a little tv or read a magazine. Since the light is just right in the morning, I love to shoot photos for my social media or blog when I have enough time. Whether it's an outfit or a simple smoothie picture for Instagram, I really try to take advantage of the perfect lighting when I can! Being the typical Type A person I am, a to do list is always necessary for me, especially on the weekends when I have more time to get things done. I write down all the things I didn't accomplish during the week and then add on the other things I want to do (ie. workout, paint my nails, buy flowers for me room, etc.). I hate not crossing things off the list so this is a very helpful method! That's about it for my mornings! Feel free to link any morning or night routines in the comments below because I bet everyone would love to see and get some new ideas! I miss the days of having summer off! I love reading morning and nighttime routines too! I need to start making a to-do list the night before - I've been feeling horribly disorganised lately! 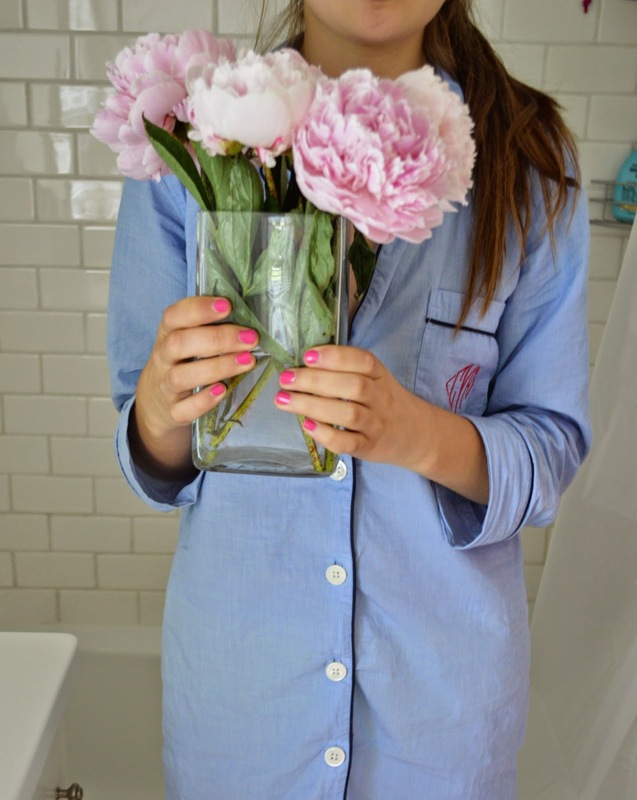 Lovely photo by the way - those peonies are beautiful! I did a Summer Morning Routine https://www.youtube.com/watch?v=VtgboXQIIVA&list=UUf4t2s3EZKgCWd5BXwx-dMA if you're interested. Love your blog! I just watched yours (both of them!) and loved it! Thanks for sharing! I love this blog post and your pajamas! This is so cute!